In Part I of this series on LP gas systems, we reviewed the properties of LP gas, tank and valve details, ABYC compliance issues, and storage requirements. In this second and final installment, we’ll discuss what you should know about LP gas plumbing, detecting and combating leaks, and carbon monoxide risks. Liquefied petroleum gas, also known as LP gas or LPG, is found aboard many cruising vessels, and with good reason. As a fuel, it’s efficient, quiet, long lasting, and reliable. And if you’re accustomed to cooking with gas at home, you’re likely to be disappointed with anything else while afloat. There is one caveat to LP gas use: if an LPG system has been improperly installed or ill maintained, it can carry tremendous potential for disaster. LP gas explosions have occurred aboard a number of vessels, and they nearly always result in the loss of life and property. However, by paying careful attention to LPG installation and usage safety measures and by adhering to voluntary American Boat & Yacht Council standards, LP gas can be used safely aboard your boat. The gas regulator is an ingenious device. It’s capable of delivering a constant supply of gas while stepping the gas’s pressure down from well over 100psi to barely 0.5psi, regardless of ambient temperature or barometric pressure conditions. (The first scuba apparatus, perfected by Jacques Cousteau, utilized a specially adapted natural-gas regulator.) LP gas regulators used for marine applications typically are made from rugged, corrosion-resistant aluminum. They must, however, be protected from the elements and from the corrosive effects of rain and sea water. If housed within a dedicated LPG locker, often they will last for decades, provided the locker does not let in water and create a jungle-like, high-humidity environment, which will take its toll on metallic LPG tanks, as well. Spraying the regulator and other metallic components inside the locker seasonally with a light corrosion inhibitor, such as CRC’s 656, will help keep corrosion at bay. LP gas systems must be equipped with a master shutoff valve that can be reached easily from the vicinity of the appliance, but no valves or plumbing unions are permitted outside of the LPG locker (more on this subject in a moment). So, how can the gas be shut off from, say, an LPG stove or heater? The answer involves the use of a remote DC (12- or 24-volt) LP gas solenoid valve. Locating the switch for this valve in the vicinity of the appliance—but not above or behind it—enables compliance. The switch activates the solenoid valve, which is located within the LPG locker, adjacent to the tank, controlling the gas supply at the source. The switch or control must be equipped with a pilot light to let the user know when the solenoid is active and thus when gas may be flowing. Because solenoids sometimes fail, it’s worth keeping a spare aboard. Without it, you may be stuck eating cold food until you can obtain a new one. Transporting gas from the LPG locker or on-deck tanks to the appliances that use it in a safe, reliable manner is of paramount importance. The plumbing that accomplishes this task may be grade K or L annealed copper tubing that conforms to ASTM B88-75a specifications for seamless copper water tubing, and its wall thickness must be at least 0.032 inch. Hose also may be utilized, provided it’s specifically suited for LP gas use, such as that which meets UL standard 21. Bear in mind that ordinary gasoline or diesel fuel hose is not compliant with this standard. Hose that is approved for use with LP gas is nearly always so labeled. The required inside diameter of the tube or hose is a function of the size of the appliance being used, the gas flow requirements, and the length of the hose or tubing run. Very large stoves or heaters, for instance, often require larger plumbing. While LPG plumbing for small appliances may have an inside diameter as narrow as 0.25 inch, plumbing with an inside diameter of 0.375 inch is more common because of its robustness and because it’s easier to find fittings in this size. End fittings or terminals for LPG plumbing must be durable, leakproof, and easy to service, assemble, and disassemble. Copper tube should utilize “long nut” flare fittings, which are less fracture prone than other fittings. Threaded NPT or tapered pipe fittings must use a thread sealant that is specifically designed for and compatible with LP gas applications. LP gas plumbing that utilizes hose may use swage terminals or field-assembled sleeve and threaded insert flare terminals. 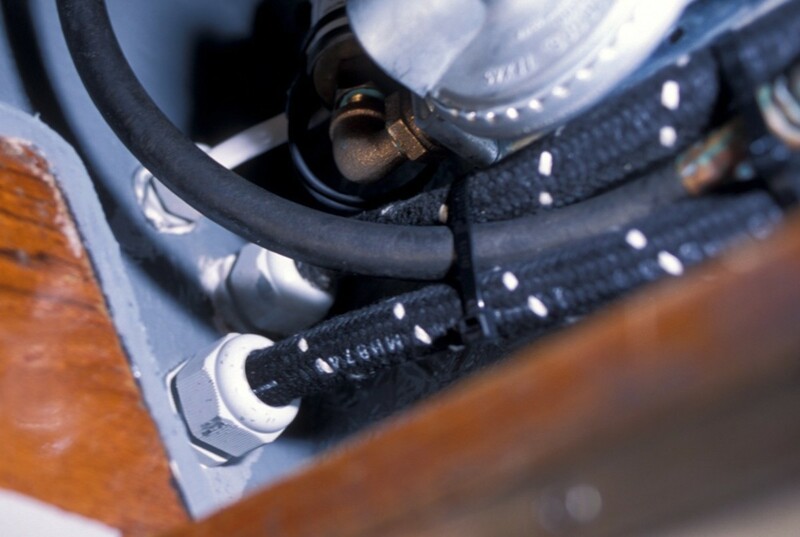 Combination barbs and hose clamps, while suitable elsewhere aboard, must not be used for LP gas plumbing. Among the most often violated of the LP gas protocols, at least where plumbing is concerned, is the installation of T-fittings, unions, or other connecting fittings outside of the LPG locker. This must never be done. 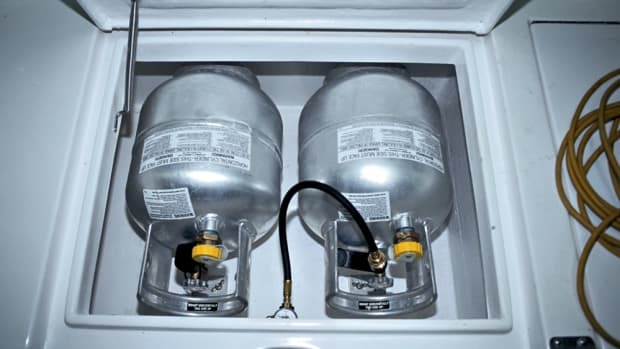 No LPG connections are permitted within the vessel, or anywhere outside the LPG locker, with two exceptions: 1) the connection at the appliance itself and 2) the transition between copper pipe and flexible hose on a gimbaled stove (such as those used aboard sailboats). Hose and copper tubing must be well secured and protected from damage. Straps or P-clips should be used to support plumbing runs at regular intervals, and hose in particular should be protected from chafe where it passes through bulkheads or other structures. Avoid running hose or copper tubing over stringers and frames or through locker bottoms, where it may be repeatedly stepped on or might have gear placed or dropped on it. Once installed, LP gas plumbing should be checked for leaks, using one (or more) of several methods. Professionals often pressurize new or repaired LPG plumbing with compressed air at approximately 5psi, roughly 10 times the working pressure of the system. Once pressurized, the system is sprayed with a mixture of water and liquid dishwashing detergent. (Detergents containing ammonia must not be used, as they may harm brass fittings.) Any bubbles indicate a potential gas leak. Additionally, a pressure gauge specifically designed for LPG systems (with a range of 0–300psi) should be permanently installed in the system. The gauge should be located within the LPG locker, immediately after the tank and before the regulator and solenoid. Test for leaks by following this procedure: With all connections completed and all appliances turned off, open the tank valve completely until the pressure gauge stops rising; it should indicate somewhere between 100 and 200psi. Then, shut the valve. The gauge’s pressure reading should remain constant for at least three minutes, and preferably 15 minutes or more. If the system will not hold pressure, check for leaks again with the soapy water solution. The sole purpose of a pressure gauge in an LP gas system is leak detection. However, the gauge will be of little value if this protocol is not carried out at least seasonally. The cautious mariner will check for leaks using this gauge-drop method every time an LPG tank is replaced. The importance of safety when using LP gas has been mentioned throughout this series of articles for obvious reasons. In addition to following proper installation methods and operational practices, other safety protocols can and should be implemented aboard vessels utilizing liquefied petroleum gas. The first line of defense is the crew. If you or anyone else on board smells gas, react quickly and calmly. Make sure the LP gas is shut off at the tank using the tank’s own manual valve. Open all hatches, ports, and bilge access panels. Avoid using any electrical gear; don’t turn anything on—or off. (Yes, there have been reports of LPG explosions occurring when equipment was switched off.) The main battery disconnect switches, however, should be turned off; these are nearly always ignition protected and thus will not ignite flammable vapors. 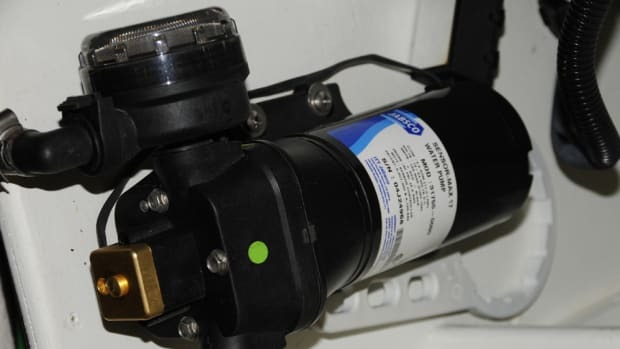 Removing large concentrations of LP gas from a vessel’s deep bilges can present a challenge unless an ignition-protected bilge evacuation blower has been installed. (Such blowers are mandated aboard gasoline-powered vessels for the safe removal of gas fumes.) Engine room blowers, if ignition protected and if they draw air out of the engine compartment, may also be used to create a vacuum and thus supply ventilation within the bilges. If you suspect that your boat’s bilges or other areas contain LP gas and you don’t have a blower, you may be forced to call the local fire department so that the gas can be safely evacuated. The next line of defense is having an electronic gas detector on board. This device will detect the presence of LP gas where the sensor is installed. Some units are capable of working with multiple sensors, and they may also be connected with the gas solenoid so that it will shut off if a leak is detected. Sensors should be installed next to and beneath appliances, especially stoves, as well as in low areas of the cabin or bilges. But be warned: “bilge gases,” curing varnish and paint, new carpet and upholstery, and hot oil and diesel fuel all have the ability to trigger LPG sensors, so be prepared for some false alarms, depending on where the sensors are installed. In some cases, it may be preferable to install sensors temporarily until you are certain they will not be repeatedly set off by fumes other than LP gas. New boats contain a preponderance of fume-emitting items—including fiberglass—and therefore are especially prone to false alarms. Sensors can easily be tested by using the gas from a butane lighter. Simply hold the lighter next to the sensor and press the trigger without lighting the flame; this should set off the alarm. My preference is to energize the gas detector’s alarm circuitry permanently through an appropriately sized fuse or circuit breaker. The circuitry can be connected to the “line” side of the house battery switch in much the same way that automatic bilge pump circuits are energized. If a circuit breaker is used, it should not be placed on the main panel, where it could be shut off inadvertently, and it should be equipped with a guard or lock. The gas detector should always be sniffing for fumes, even when you are not aboard. Why? Gas leaks can occur while you aren’t on the boat, and if leaking gas is present when you step aboard, you’ll want to know right away—before you switch on any electrical equipment. The energy used by a gas detector is miniscule (just a few milliamps), so it’s unlikely that it will deplete your batteries, unless you leave your boat unattended for weeks or months at a time without a charge source present. Of course, the life of your battery bank is a function of its capacity. The final safety consideration regarding LPG involves the detection of yet another gas: carbon monoxide, or CO. Not to be confused with CO2 (carbon dioxide), carbon monoxide is a colorless, odorless, tasteless gas that weighs roughly the same as air. Unlike LPG, which is heavier than air, CO can become evenly distributed throughout a cabin or other confined area. CO is highly poisonous by virtue of its ability to prevent red blood cells from transporting oxygen to the body’s tissues. It is especially dangerous because it cannot be readily sensed, other than by the symptoms it induces: everything from headaches and flu-like symptoms, which can easily be misdiagnosed or ignored, to convulsions and unconsciousness, at which point it’s usually too late to take action. Several hundred people die each year from CO poisoning in the United States; some of these deaths occur aboard recreational and commercial vessels. Because of the airtight nature of boats and the nearly universal presence of CO-producing devices on board—stoves, heaters, engines, generators, and the like—boaters are at especially high risk for CO poisoning. Carbon monoxide is produced by incomplete combustion of carbon-containing fuels, including gasoline, wood, charcoal, and LP gas. The “cleaner” the combustion, the less CO is produced. (Gasoline-fueled cars equipped with catalytic converters produce considerably less CO than their non-catalyst-equipped ancestors.) Contrary to popular belief, diesel engines do produce CO, but not very much of it. Diesel exhaust contains about 0.5 percent CO, compared with a non-catalyst-equipped gasoline engine’s 7–11 percent; the latter figure is well within the range of lethality, depending on the duration of exposure. It should be pointed out that, in high enough concentrations and under less than ideal combustion conditions, diesel exhaust can still be harmful—even toxic—by means other than CO poisoning. The insidiousness of CO poisoning and the way it occurs in conjunction with equipment fueled by LP gas is of particular interest. As the quantity of CO inside a vessel’s cabin increases as a result of the burning of LPG, the completeness with which the appliance’s flame burns diminishes. This, in turn, causes more CO to be produced, which further compromises the appliance’s flame, and so on and so forth. It’s also important to note that the effects of CO poisoning are cumulative; that is, exposure to relatively low concentrations of CO over long periods may be as harmful as exposure to high concentrations over shorter periods. If you suspect that you or someone aboard your boat is suffering from carbon monoxide poisoning, move immediately to fresh air and then administer 100 percent oxygen. The best solution to CO poisoning is prevention—don’t let it happen to you. Today, that’s easier than ever, because CO detectors are readily available. Detectors should be installed aboard every boat, in every accommodations space, including sleeping quarters and in places where folks may nap or simply fall asleep, such as the saloon or pilothouse. The newest CO detectors are virtually immune to false alarms caused by gases emitted by paint, upholstery, and fiberglass. Although not impossible, it’s unlikely that common additives in diesel fuel will increase a CO detector’s potential to sound a false alarm; all alarms should be treated as genuine. If you had a CO detector years ago and “decommissioned” it because of its propensity to sound when no CO appeared to be present, it’s time to reconsider that decision. Finally, you may be thinking: I don’t have LP gas aboard, and diesels produce virtually no CO, so why do I need a CO detector on my diesel-powered boat? The answer is, you do need one, and here’s why. Imagine you are docked or rafted up next to another boat whose engine or generator is running (assume its fuel source is gasoline). It’s perfect sleeping weather—just cool enough for a light blanket—so you head for your bunk, leaving your ports or deck hatches open. You can hear water lapping at the hull, and the boat rocks you gently to sleep. All seems right with the world. Unbeknownst to you, a light breeze is blowing, and the exhaust from your neighbor’s engine is wafting in through your cabin’s open ports. As quickly as that, you’ve become a statistic. Every boat with an enclosed cabin, regardless of its fuel source or the equipment it carries on board, needs CO detectors in every accommodations space. In contrast to the standard procedure with LPG detectors, many vessel owners prefer to wire CO detectors to the “load” or “output” side of the vessel’s main house battery switch through an appropriately sized fuse or locked/protected circuit breaker. This means the detectors will be energized only when the battery switch is on, which will likely be the case whenever people are aboard. There’s no sense in the CO detector operating when no one is on the boat, particularly if the vessel is moored, because the detector does use battery power and could deplete the batteries, given enough time. If you do wire your carbon monoxide detector in this manner, you should place a placard next to the battery switch to indicate that turning it off will deactivate the detector. If you never leave your vessel without a charge source present—either dockside power or a solar array—then it’s best to wire the CO detector to the “line” or “always on” side of the battery switch. Again, use an appropriately sized fuse or locked/protected circuit breaker. Wired in this manner, the CO detector is never off unless its fuse is removed or the breaker is switched off. I prefer units that rely on the vessel’s own power rather than internal batteries. After all, are you going to cut short your cruise or vacation because your CO detector’s 9-volt battery is dead and you have no replacement? While a CO detector whose battery is dying often will chirp for some time, if this occurs while you’re away from the boat, you’ll never know it. As with LPG detectors, a CO detector’s circuit breaker must not be located on the main electrical panel, or anywhere else where it could easily be turned off, and it should be equipped with a guard or lock. Most hardwired CO detectors include a pilot light; if the light is off, then the unit is not energized and is not offering protection. Many professional installers use fuses, rather than circuit breakers, for CO and LPG detectors in order to prevent these important devices from being inadvertently turned off with other circuit breakers. (If your detector utilizes a fuse, make sure that it is well labeled and that you have spares.) Neither a CO detector nor an LPG detector should ever be wired through an ordinary on-off switch. Finally, CO detectors do wear out. Depending on the manufacturer, this could occur between three and five years after installation. Some can be returned to the manufacturer for “refurbishment,” while others simply need to be replaced. If you don’t know how old your detector is (if it came with a used vessel, for instance), or if you are not sure whether it works properly, replace it. CO detectors are relatively inexpensive, often costing well under $100. Carbon monoxide poisoning is a safety issue that should not be taken lightly. Few responsibilities are as critical as installing and ensuring the proper operation of a CO detector or detectors aboard your boat. Just as important is making certain that your vessel’s LP gas system operates safely. It must be properly installed, ABYC compliant, correctly maintained, and inspected regularly for faults, malfunctions, and damage. This article was excerpted from Steve’s forthcoming book on marine systems, scheduled to be published by McGraw-Hill in 2010. Steve owns and operates Steve D’Antonio Marine Consulting (www.stevedmarineconsulting.com), providing consulting services to boat buyers, boat owners, and the marine industry.